Blog 37: A Changing of the Guard. * A Renewal. ** A Rebirth. *** Or something like that. 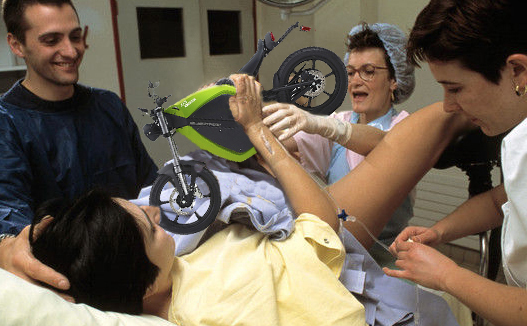 “A new bike” is probably more accurate, but a bit boring. Not as much Flair. Ok: Background. 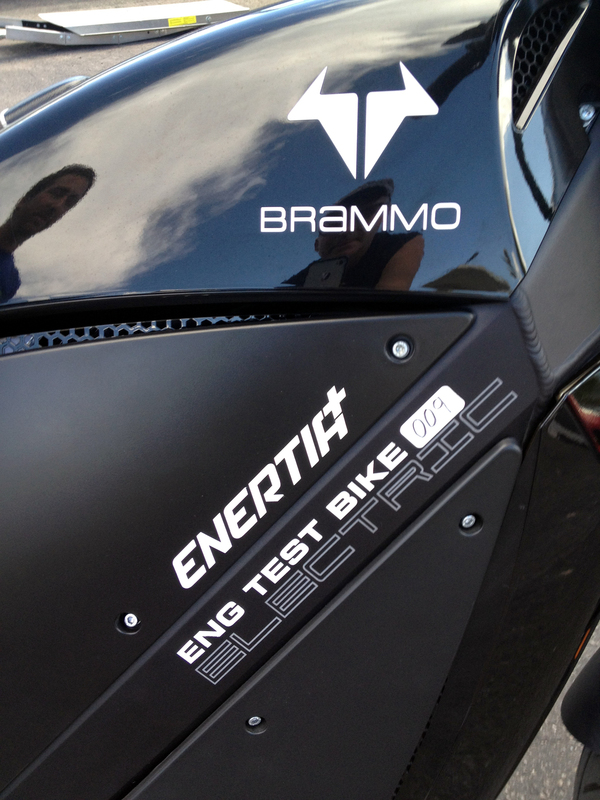 Brammo was nice enough to lend me a loaner Enertia for an EXTENDED period of time. Since the middle of October of 2011 to last Saturday I’ve put a bit over 4800 miles on her (not bad for a shorter range city commuter). Final Mileage. 5252. I got her with 450 on the odometer. She is great for my city commute. Great to go to the Isotope games. For rides around town. ETC ETC. 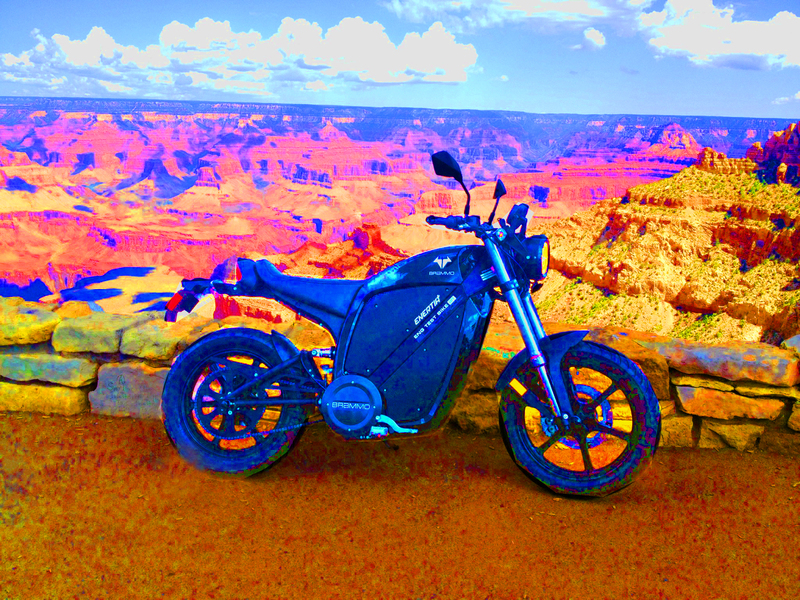 But I do some longer rides and her 40 miles range is not enough for rides to Tinkertown, Sandia Crest, Los Lunas and some of my other favorite rides. 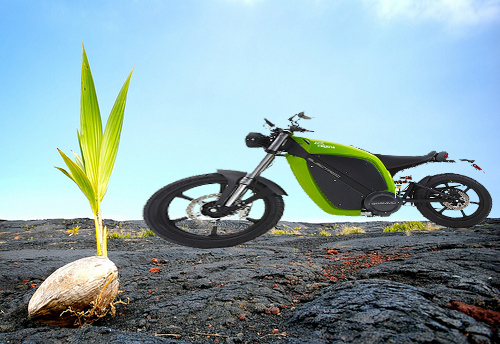 So, while I was very happy to have the Enertia and love her dearly, I’ve bugged Brammo from time to time telling them I would love to try out the Enertia Plus (a bike with twice the range of the Enertia). And the term “from time to time” loosely translates to hourly. For the last 9 months. Like a fever after eating a “slightly off” Creamy Parmesan Chicken dinner at Applebees, I am relentless. And fairly nauseating. I played hard to get. And by that I mean I emailed back within microseconds of getting their email. My email was the very refined and dignified, “Yes, God YES, send it now and no back-sees” or something along those lines. They said “oh, damn, what have we gotten ourselves into”….but the no back-sees rule was already invoked and so a deal was made. 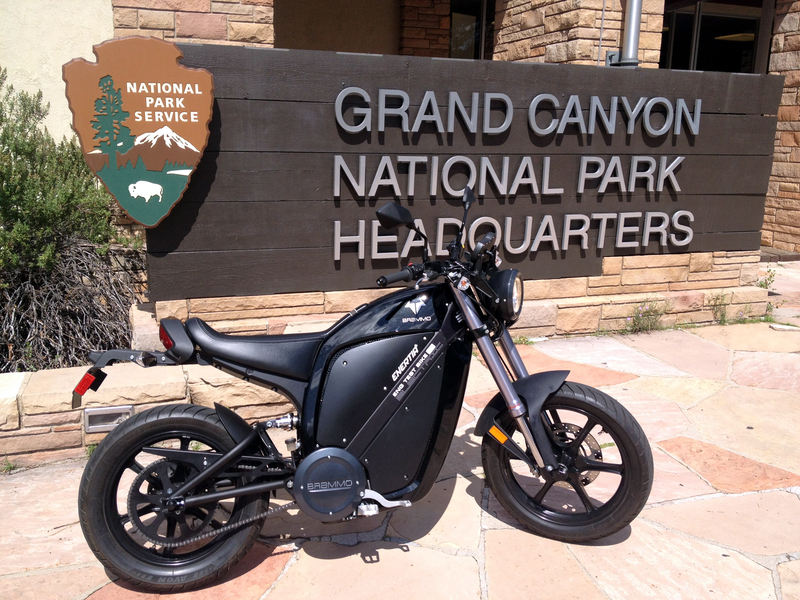 Matt Nelson was going to ship the bike to LA, as the people there wanted to try out the Plus. Then he would load it on a truck and bring it to Las Vegas. I would meet him there and give him the green Legacy Enertia and he would give/loan me the Plus. For me it is a 9 hour drive from Albuquerque to Las Vegas (which I had just done heading to Laguna Seca and back. Three Vegas visits in a months time…crazy. Though crazy is a strong term. Driving three times to Vegas in a month is probably excessive. Crazy might better describe the man walking down Tropicana Ave with the large, very very fresh urine stain down the front of his long khaki shorts). I was meeting Matt at the Motel 6 at 4pm. Why the Motel 6 when there are so many grand hotels in Vegas? The Motel 6 has an easier parking lot to do the exchange and less guards than the fancy Hotels. Plus it had the added bonus of feeling like a drug buy on Breaking Bad. And yes, I dressed for the occasion. 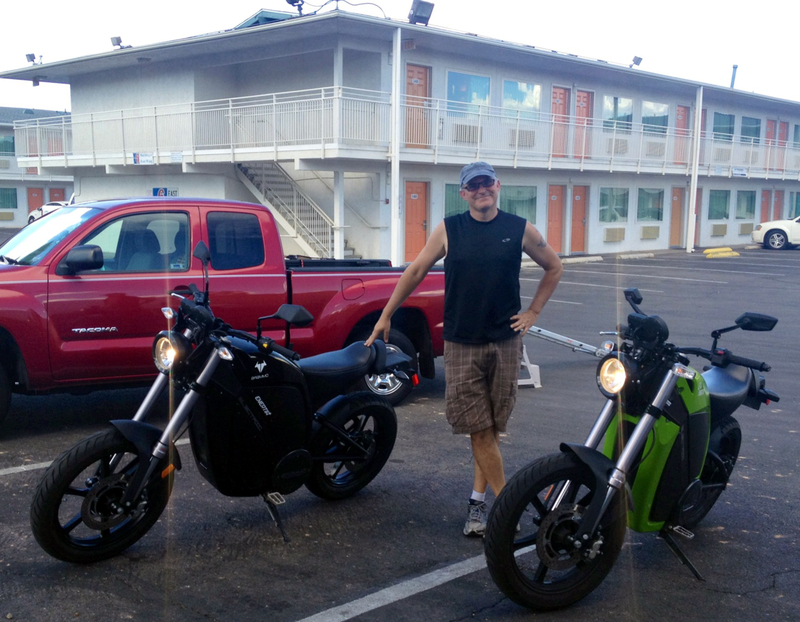 Matt went over a few changes between the bikes, we chatted a bit and then said our goodbyes. Nice young man. I was slightly surprised that Brammo sent somebody to go over the bike with me. 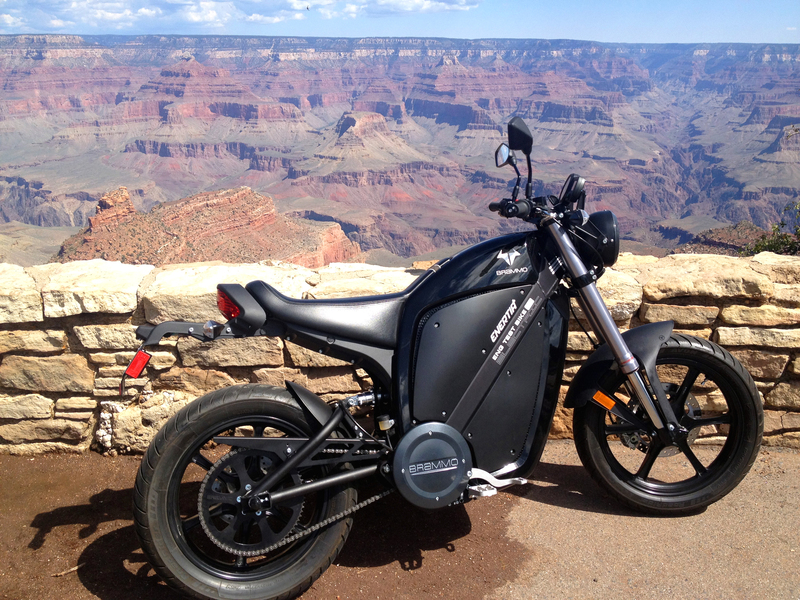 I’ve ridden the Enertia about as much as anybody in the world has. They shipped the first bike directly to my home with the only instructions being, “There is only one key. DO NOT lose it.” 4800 miles later and I still had that one key. 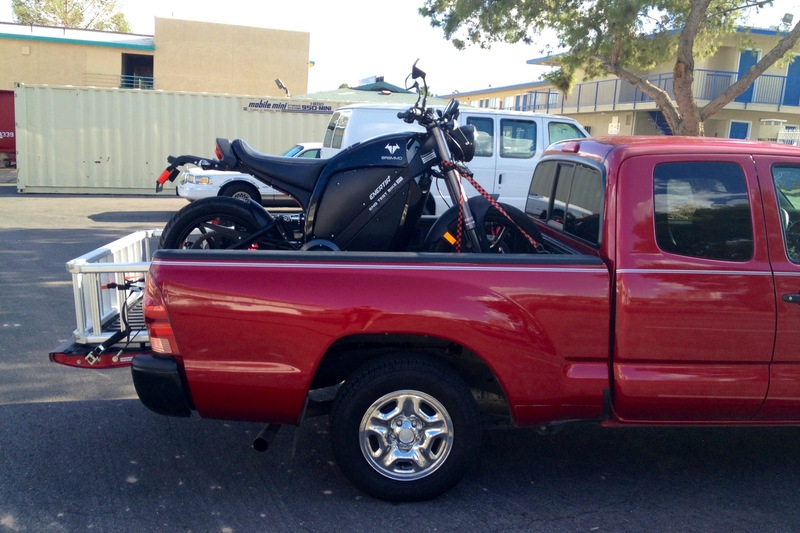 The Pickup….in a pickup. All we needed to complete the image is a duffel bag of cash. I had planned to spend the night in Vegas, but even after all the driving and the exchange it was still only 5pm. Lots of daylight hours and I hoped to do a couple of stops on the way home Sunday. It would be easier to do those stops if I could get a couple of hours on the road heading home. 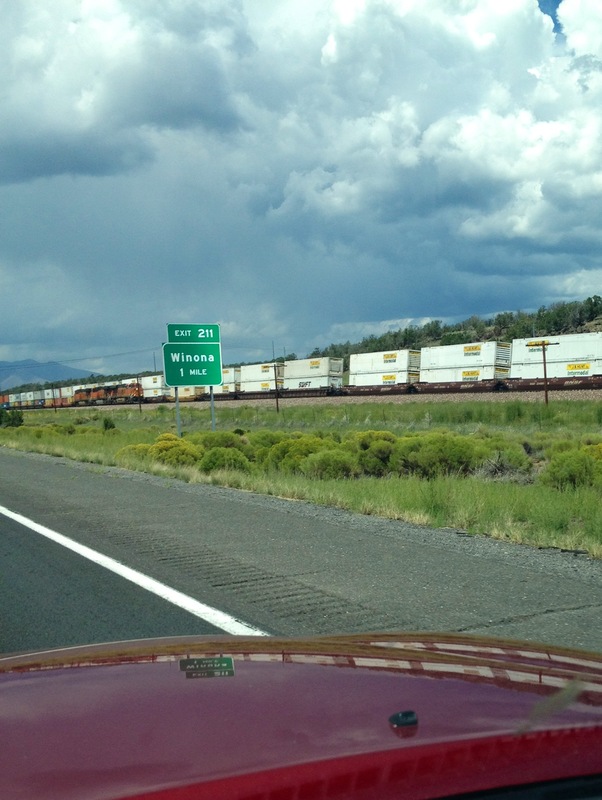 9 hours of Saturday driving became 11 hours as I turned around and headed to Kingman, Arizona. The bike didn’t need a charge, but I just don’t trust…well anybody. Plus, after 27 years of marriage, I don’t like sleeping alone. 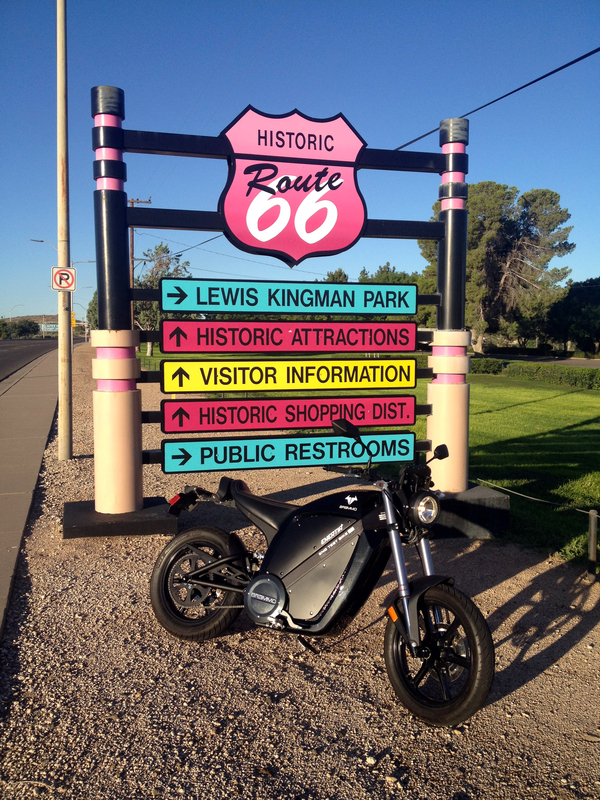 +++ Rt 66..Kingman Arizona…and Public Restrooms for the Win. 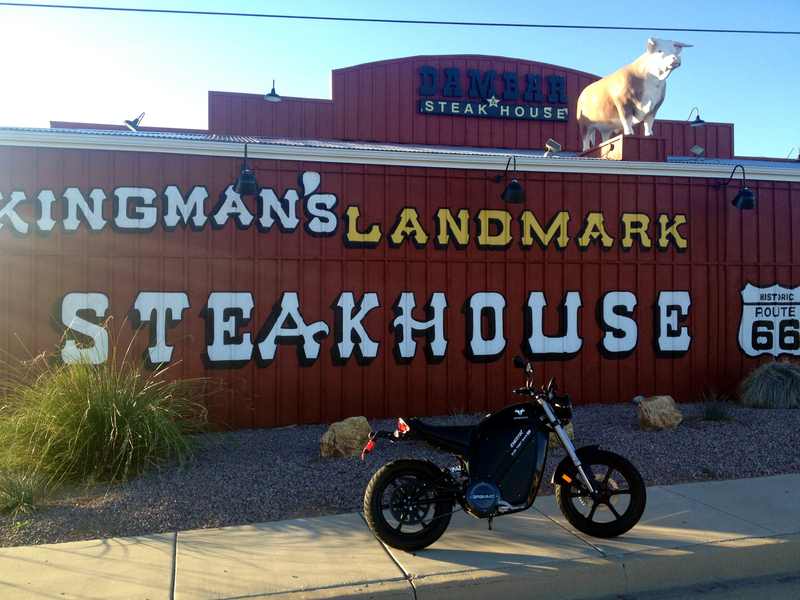 I got up early to ride around Kingman. Went about 2 miles and turned around. Not much reason to visit more than that. Something about a Steakhouse with a fake Bull on the roof always makes me hungry. So Kingman was boring. But they did have two Motel 6s. I, of course, went to the wrong one at first. Why Motel 6? And why so often? 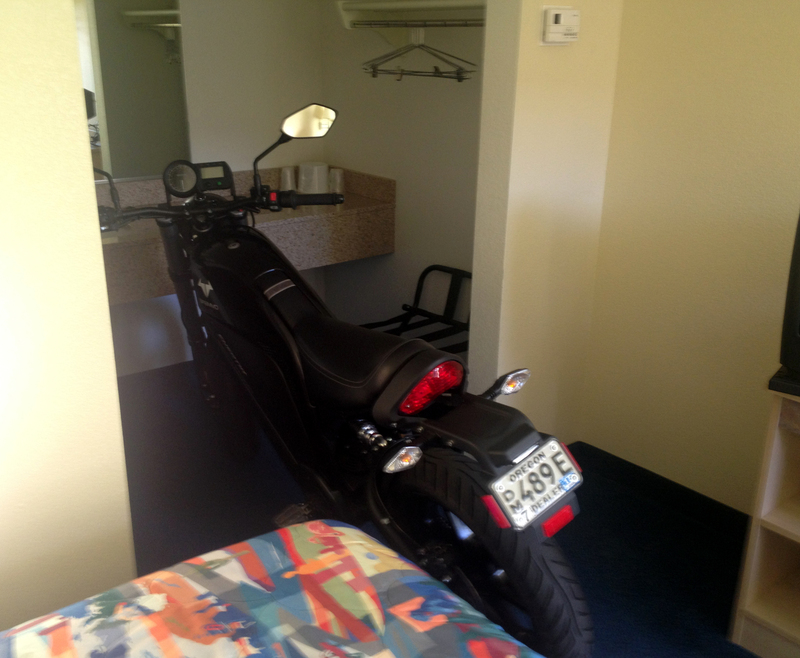 (I have never stayed at a Motel 6 before my trip to Laguna Seca) Well they have first floor rooms and external doors…easier to get the bike into the room. And they are everywhere…and cheap. But Kingman was just a place to sleep and get ready for Sunday. 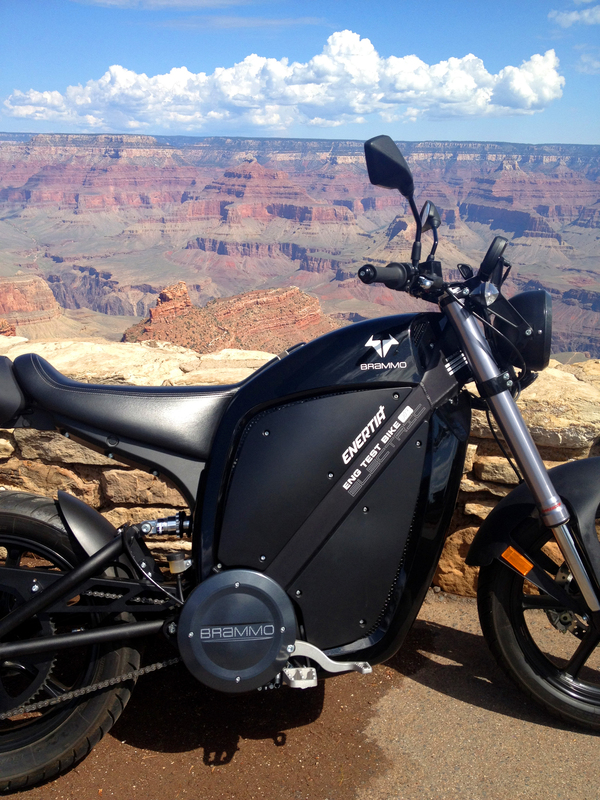 What I really wanted to do on Sunday was hit the Grand Canyon. It is only about a hour detour off the highway I was taking home (so adding about 3 hours to my day). I thought it would be a great place to take some photos of the new bike. So I turn north to the Canyon and find out a few things. It’s been a while since I was there. Major road improvements. Though improvements might be the wrong word. Getting to the rim use to be a single road. Not anymore. I basically got lost and couldn’t find the rim for a while. Let that sink in for a moment. I couldn’t find the rim. At the Grand Freakin’ Canyon. Sigh. It now costs 25 bucks a person to get in. Yikes. I figured they must have added a roller coaster or something. Sadly, no roller coaster. Yeah…Found it. So beautiful and peaceful. One place that has remained semi untouched in this land. No McDonald’s signs on the mesa tops. No cell phone towers. Just rocks slowly eroding. Leaving that spot. The people of the bike waved me over. I should have keep the camera running as THEY WERE GREAT! But I don’t like filming people if they don’t know it from the start. They loved the bike. Later, heading back in the truck, they pulled up beside me and gave a big thumbs up. I meet so many great people on these trips. Same spot. It’s a nice spot, so I took a few photos here. And then I went looking for new places. 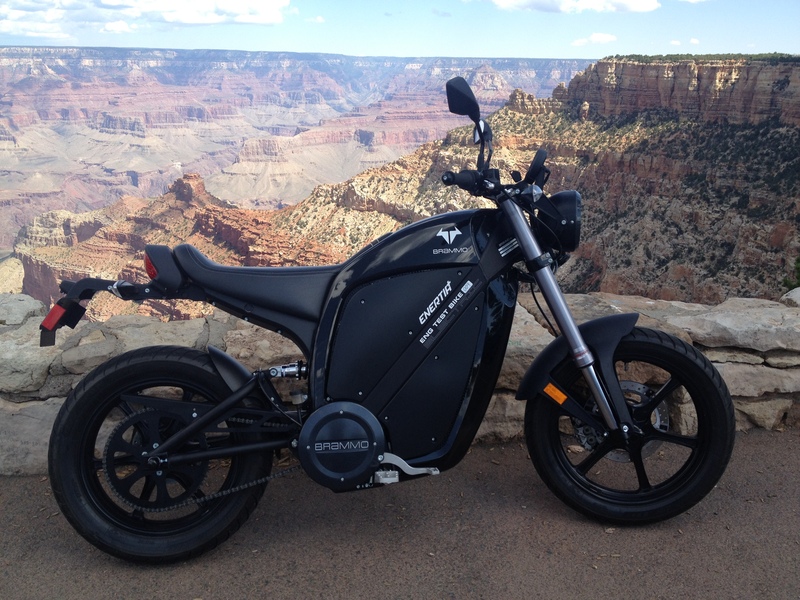 Parked up on the walkway in the Grand Canyon. No issues. Much nice than the Hoover Dam people. Grrrr. And found a second nice view a couple miles from the first spot. And a HUGE vulture flew by. That vulture was much bigger than the video shows it. And then this is for me Mum….she loves when I do this stuff. Someday I’ll have her tell the story of when I was a kid hanging off a rock over the canyon. Good Times. While semi-lost I did find the Mules. Unionize Mules, Unionize. Heading back to the truck I join some bikes with trailers. 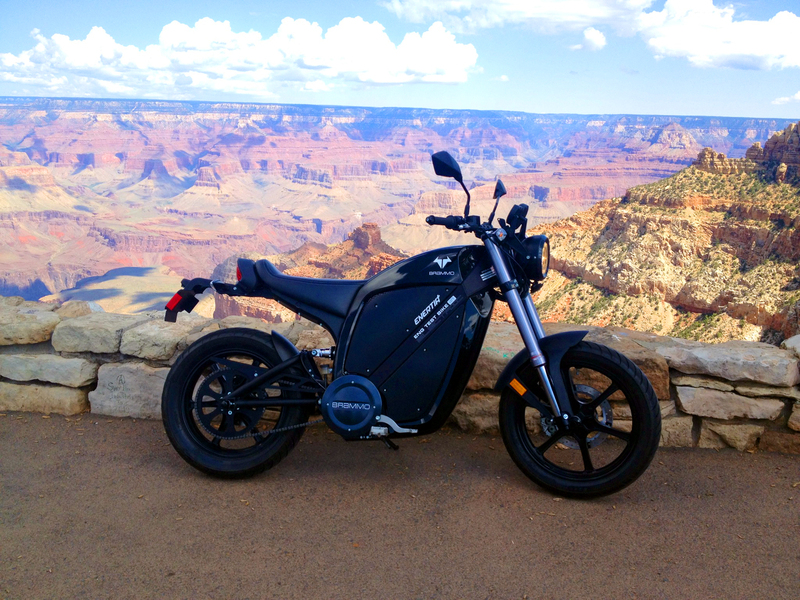 So we say goodbye to my quick detour to the Grand Canyon. Next was more driving. Grand Canyon through Flagstaff to the Meteor Crater. I was going to stop in Flagstaff to take a photo for the whole Rt 66 thing. But I wasn’t feeling it…so I just drove right on through. Plus it was raining in Flagstaff. 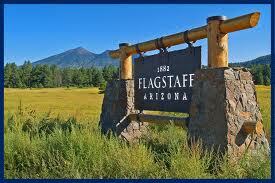 I have NEVER been through Flagstaff when it isn’t raining. So here is a photo….not by me. You can tell it isn’t by me because of the FREAKIN’ BLUE SKIES. 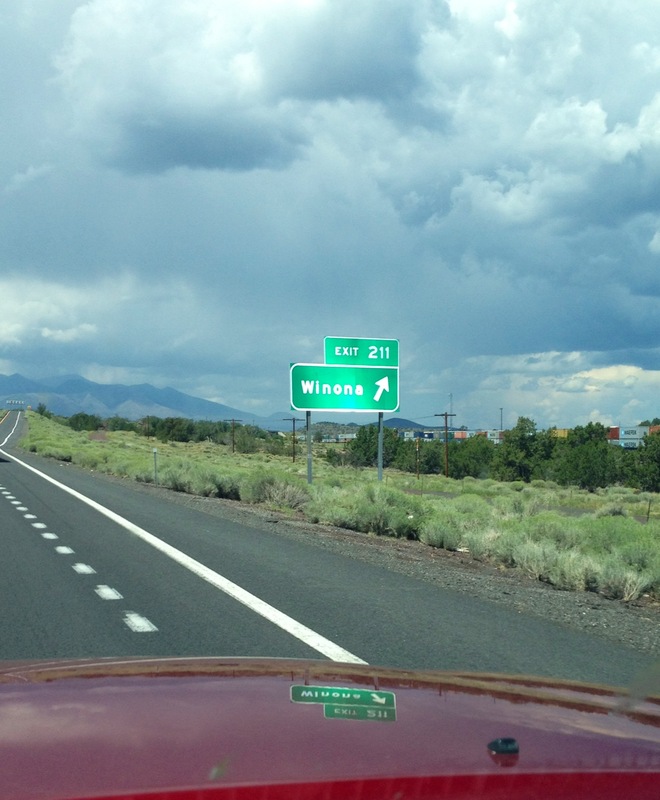 Only a few miles East of Flagstaff is Winona. Winona isn’t even a town. There is nothing in Winona. Yet there is an exit. There are multiple signs. But basically Winona is only known for being in the Rt.66 song. And it was only in the song because the writer needed a rhyme for Arizona. Here I am a mile for wonderful Winona. Notice the cloudy skies. That is because Winona is close to that rainhole know as Flagstaff. Here I am AT Winona. Notice how the sun only shines on the sign. It does appear that there are 4 homes in Winona. All relatives of Booby Troup I presume. 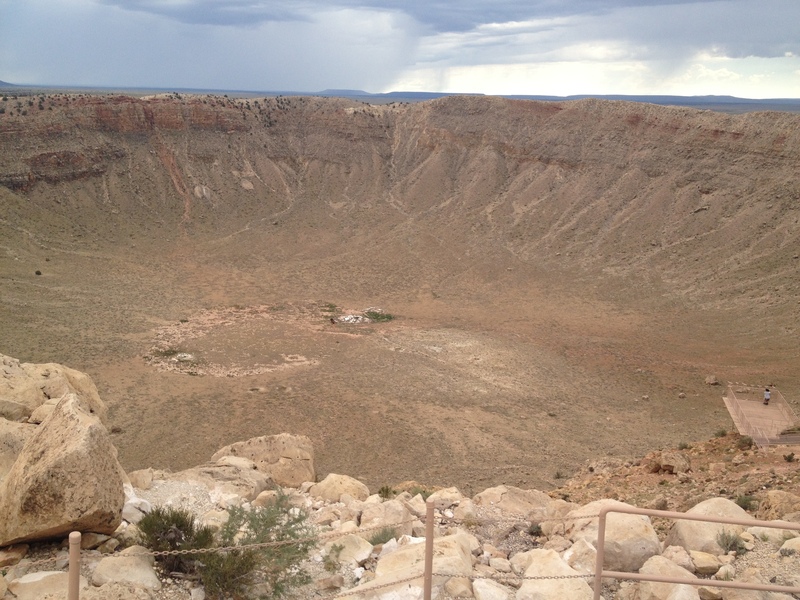 So, surprisingly, I just drove right passed Winona and on to the Meteor Crater. I really like the contrast of the Grand Canyon and the Meteor Crater. Sure both are very close to each other physically. Sure both can be seen from an airplane or satellite. But one was made in less than 10 seconds, one was made over millions of years (and counting). I had hoped to take the bike up on the crater’s ridge…but the whole area is fenced off. I will have to plan better next time. Stopped in front. A family from Tennessee came over and talked a fair bit of time. Nice family. They stopped back a second time to ask my name. They wanted to tell the company how helpful I was. I told them I don’t work for Brammo, just a fan. They still wanted to tell the company how helpful their “fan” was. They really want an electric snowmobile. 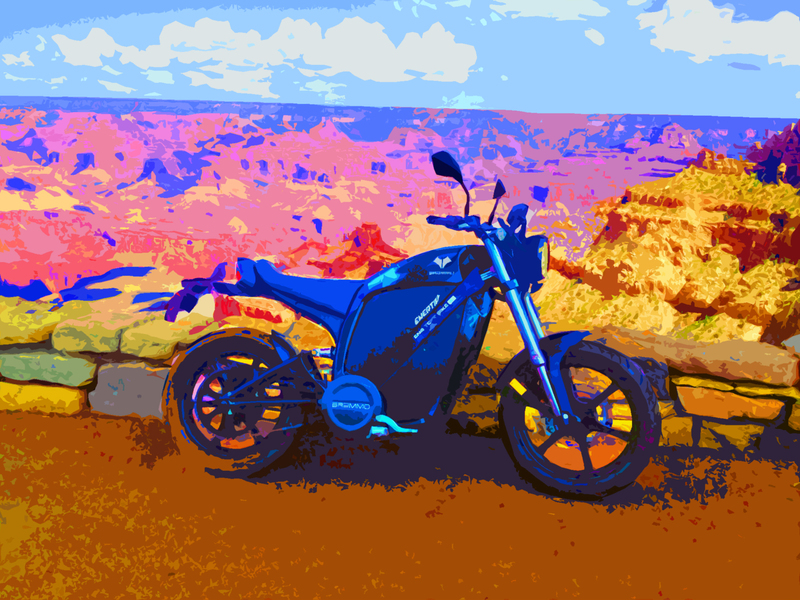 And an electric ATV for hunting. Quiet is good for hunting. From the Meteor Crater I went straight home. 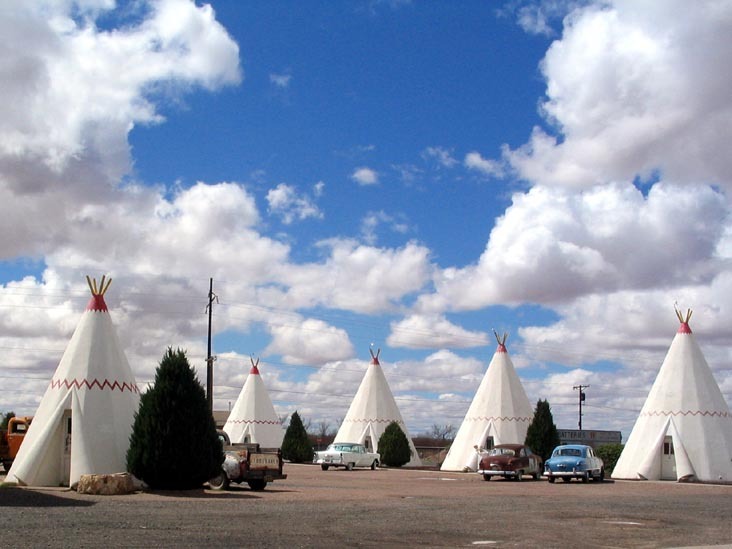 I wanted to stop at Holbrook at the Wigwam Motel, but passed Holbrook without even seeing it. That scared me a bit. I was listening to audiobooks and driving and focusing on the cars and trucks and the bike in the back and didn’t see Holbrook at all. Oh well…Next time. Not my photo. For all I know Holbrook, like an episode of the Twilight Zone, is no longer there. 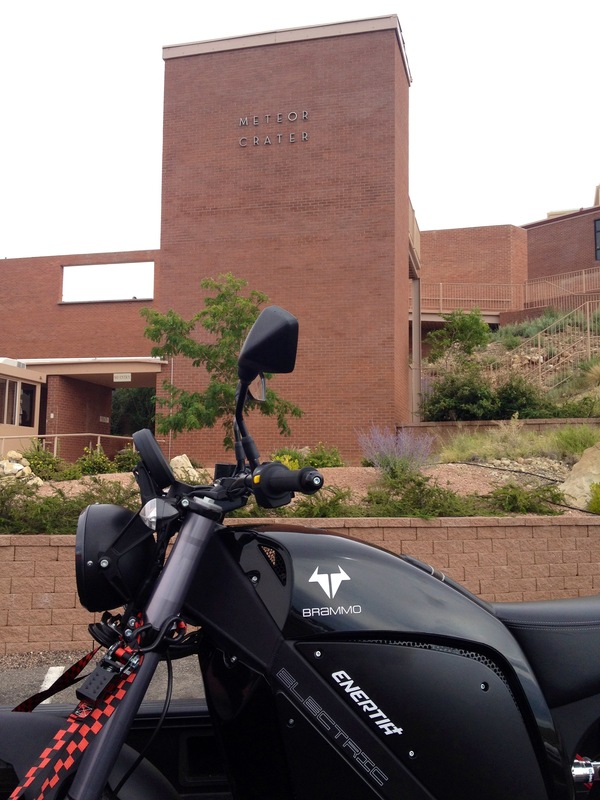 And I didn’t stop in Gallup either. It may be in the song, but dang, I’ve been going to OutReach Clinic in Gallup every month for the last 16 years. And that is more than enough times for me. So home. Over 1300 miles in 37 hours. By myself. And not even hard. Kinda fun actually. Now comes the “putting on some miles” on the new bike. 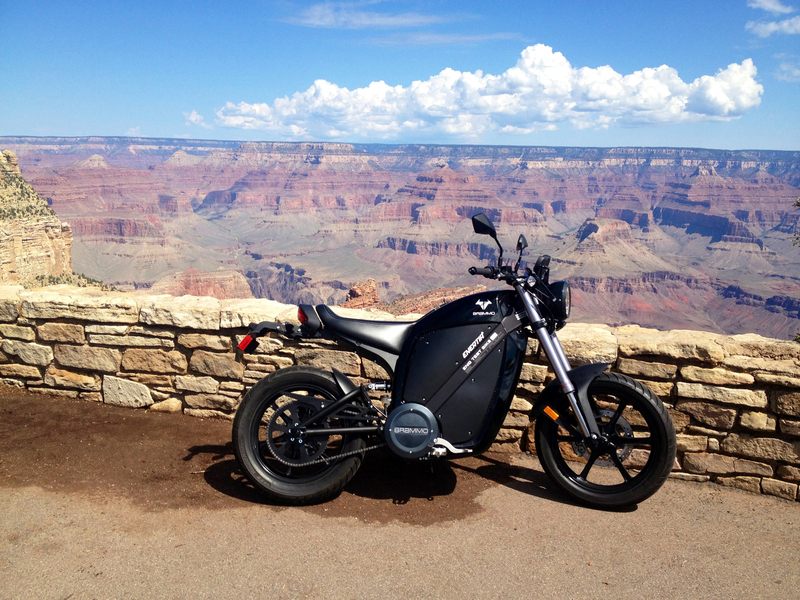 Adrian has already challenged me to put over 100 miles on the bike with one charge…while having a 5000 foot climb. That will be tough as I want to go fast. And going fast uses up the battery quicker. But I’ll try. 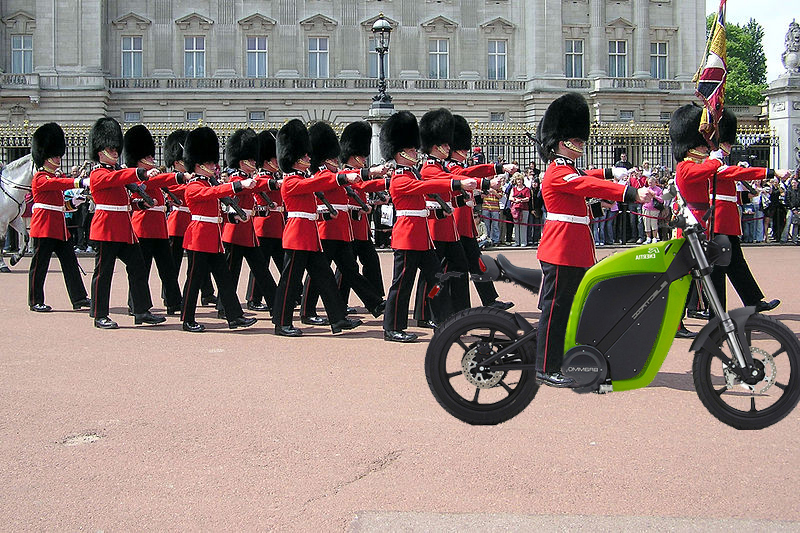 * A Changing of the Guard. thanks…I will double dog try. granola bar, fruit snacks and cashews…and cherry coke zero to stay awake. i could have been a truck driver. I just started with Seca listening to audiobooks while driving. makes the miles fly. 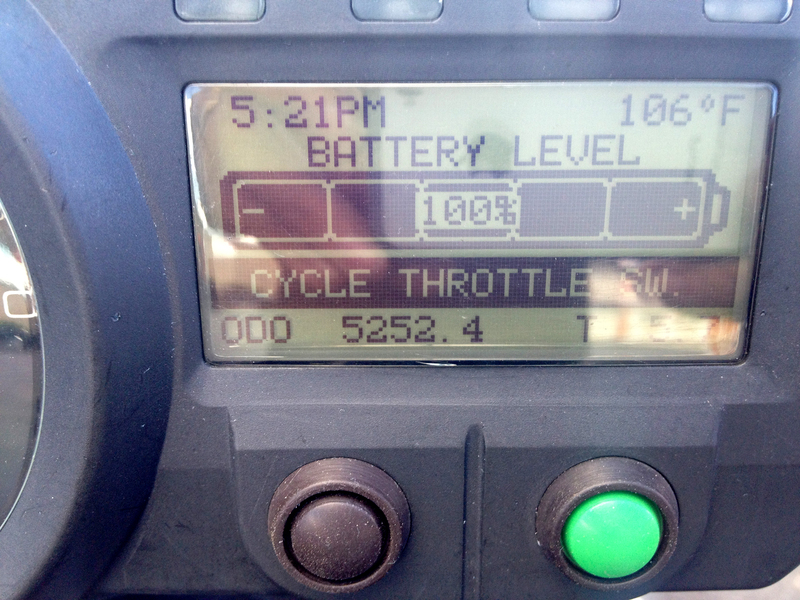 Nice to have the range…surprised at how different the ride is…have to adjust some. I started remembering you hanging from rocks at the Grand Canyon about three photos before you mentioned it. Does that graffiti really say Dan Quayle?